The theft of boaters’ property was carried out by CRT contractors Fountains assisted by the Vale of Pewsey volunteer work boat crew. At the end of September, CRT fixed notices to items of boaters’ property on the towpath that stated they would be seized and destroyed if the boaters did not move them by 12th October. As a result of complaints about notices being fixed to bikes and pushchairs, CRT clarified that items like these would not be seized. It appears that CRT has disregarded this assurance and has seized items that were not labelled in the sweep at the end of September. Angry and upset boaters followed the Vale of Pewsey work boat to the bins at Dundas where the seized items were being unloaded into the bin compound and into a truck (pictured). They confronted the volunteers unloading the boat. The contractors had taken several van loads to the CRT Devizes yard to be kept at a compound where it will be held for one month (according to the notice) for the owners to retrieve it and then disposed of in a licenced waste facility. When confronted by boaters, one of the volunteers said “we will clean up this canal with or without the support of CRT or anyone else”. At the end of September a CRT member of staff told a boater that the notices threatening to remove bikes and pushchairs were “an accident”. According to CRT “all the materials left on the towpaths and bottom of hedges are having signs put on them, notifying impending removal if the owners don’t claim them back first. We won’t be removing peoples bikes, push chairs etc”. 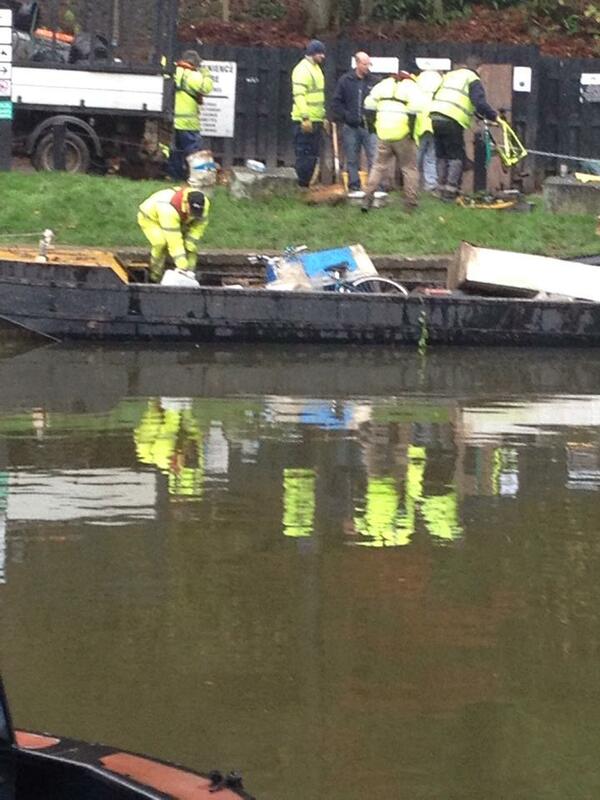 However CRT said that they will be removing “the materials that shouldn’t be cluttering the towpath”. Rumour has it that the new K&A Manager Mark Evans thinks that boaters’ stuff on the towpath makes the canal look untidy. This ties in with the new manager’s background in landscape and estate management. The CRT staff member in charge of the seizure of our property is Dale Marshall who can be reached on 07711 403480. If you have lost a bike with a turquoise bell, or some packaged cladding or battening it was removed to Devizes. This entry was posted on Friday, November 20th, 2015 at 12:27 am	and is filed under News. You can follow any responses to this entry through the RSS 2.0 feed. You can skip to the end and leave a response. Pinging is currently not allowed.